DBeaver is a Java-based universal database tool for developers, DBAs and analysts. It can be used on all major operating systems, accessing a wide range of databases. 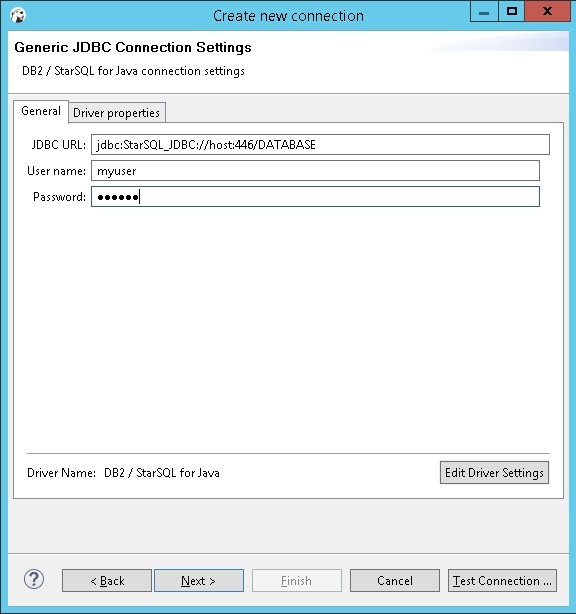 The StarSQL for Java JDBC driver can be used with DBeaver to access DB2 data. This document explains how to configure DBeaver to use StarSQL for Java. Install StarSQL for Java. Note the install location (e.g. C:\Program Files (x86)\StarQuest\StarSQL_Java\ on 64-bit Windows; /usr/share/starsql_java on Linux). Configure StarSQL for Java licensing: edit StarLicense.properties and/or configure licensing with the License Configuration application, or create a DNS name starlic pointing to a StarLicense server. You can use one of the supplied sample applications to verify licensing. See Licensing for additional information. Start the Driver Manager dialog using the Database->Driver Manager menu choice. Click the New button to add a new driver. 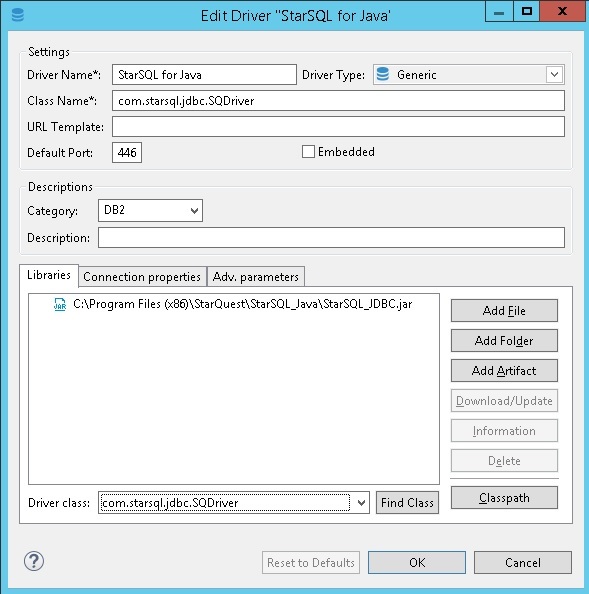 Click Find Class; the Class Name field above will be populated as com.starsql.jdbc.SQDriver. Add additional Connection Properties if desired. Create a connection using the Database->New Connection menu choice. Select StarSQL for Java from the DB2 Category. mklink "C:\Program Files\DBeaver\plugins\StarLicense.properties" "C:\Program Files (x86)\StarQuest\StarSQL_Java\StarLicense.properties"
Create a DNS entry starlic, pointing to a StarLicense server, either on your DNS server or in your local hosts file (\Windows\System32\drivers\etc\hosts or /etc/hosts).